CityBuzz is an app for residents and visitors acting as their one stop resource for detailed city information. This app allows to conveniently search for places to eat, shop, drink, relax, get bus and train schedules, emergency numbers. Information regarding weather, banks, government holidays, news, jobs, to-let openings and so much more are made available to the user. CityBuzz is built with a robust backend that manages all the content on the application, as well has manages payments, scheduling, and client listings for operational purposes. Android app, Web admin, GPS system and Web Services to connect admin and app. 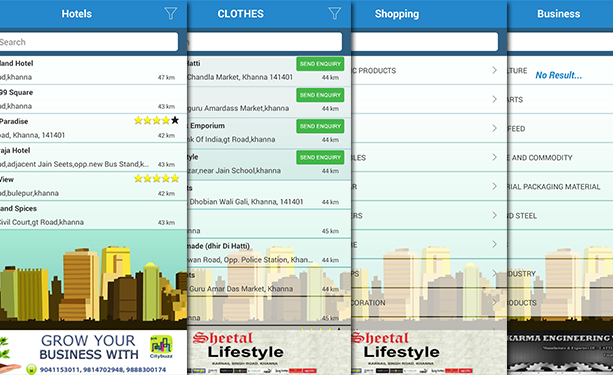 User Friendly - CityBuzz as an app is designed keeping in mind the target users. Appealing looks with user friendly interface a combination that ensures a user experience that facilities interactivity, while making data available easily. All the features of the app are placed such that they are easily and intuitively accessible, making it one of the easiest to use apps in the same category. 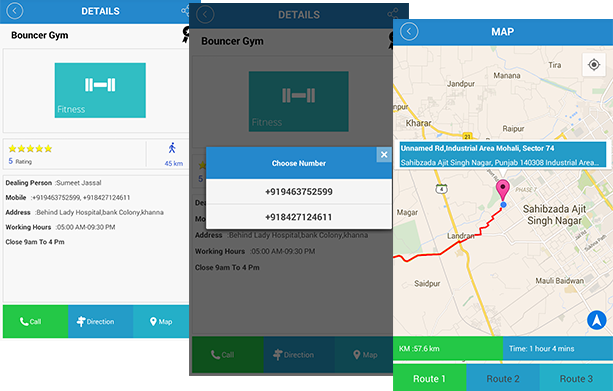 Latest Features - To enhance the credibility and enable functionalities, CityBuzz, was integrated with latest technologies like GPS navigation, Google Maps, Tap to call, Weather reports and many others. Users have access to GPS functionality combined with Google Maps, which enables them to find their location and view places of interest nearby, making easy for them to plan their routes to reach a desired destination. Further, the Tap to call function is part of this app, helping users contact business owners or other concerned persons without having to search for the contact info, with just a tap of a finger. Business Directory - The app also serves as the Business directory of an area. Many different types of businesses and important places like Banks, ATMs, Religious Places, Emergency services, Eating Points, Pubs etc. can be located via the app. All the information regarding the place of interest, including Contact Person, Contact details, Address, Products, and more are available to users on the app. Users can search for any business category or specific locations using many different criteria. Web Admin and Web Services - To permit complete control, the admin of the app has been provided with a comprehensive backend, which also supports Web services. The Web admin panel is used to manage the database and records of all activity on the app. This makes it easy for the admin to make changes to the app like adding, updating, editing info in the database from any internet connected device. Further, the admin is able to control all designated ad spaces on the application. The system also maintains a record of all payments received, and therefore enables operational functionalities through the all inclusive backend.